Conservation areas are places that are deemed to be of special architectural or historic interest, and they require management to protect their specific character. Every local authority in England has at least one conservation area. Conservation area controls aim to preserve the qualities that make the area unique. Most local authorities provide supplementary guidance (SPG) outlining the specific considerations to be understood in each area. Visit Architecture for London’s portfolio to see our recent projects in conservation areas, or contact us on 020 3637 4236. A conservation area is usually designated by the local authority, but can also be created by Historic England in London, following consultation with the Secretary of State for Digital, Culture, Media and Sport. The Secretary of State can also designate a conservation area anywhere in England. About 1,000 of England’s 10,000 conservation areas are in Greater London. In some London boroughs such as Islington, Westminster or Kensington & Chelsea there are very few streets that are not within conservation areas. It is important to ascertain whether the property falls within a conservation area at an early stage in any project. Whether you are planning on building a new home or making improvements on an existing property, the location will have an impact on the planning process. By following the local guidance, a conservation area can help produce better and more considerate design. Owning a property in a conservation area need not be a hindrance when achieving consent for alterations. The local authority will have designated the area to ensure that any future alterations simply preserve or enhance the local character. A conservation officer will assess the quality of any proposed design, rather than the style, so it is not necessarily a problem to propose a modern design. A conservation area not only takes into consideration the buildings, but also paths, boundaries, materials and street layouts. Therefore any alterations to these features need to be considered carefully during the design process. Within the conservation appraisal guidelines there is likely to be a chapter on building materials in the local vernacular. If your design proposal acknowledges local materials it may stand more chance of success at planning. Engagement with the local authority can be helpful to show that the project has taken a considered approach to design. This often results in useful feedback and a smoother planning process. Engagement can be undertaken with pre-application advice, with various levels of service ranging from written feedback and a follow-up letter to a face-to-face meeting with a planning officer. It is also good practice to engage with the parish council and any neighbours, giving you the opportunity to address concerns early on in the design process. Consent is required for the total or substantial demolition of buildings within a conservation area. If consent is refused, there are six months in which to appeal. 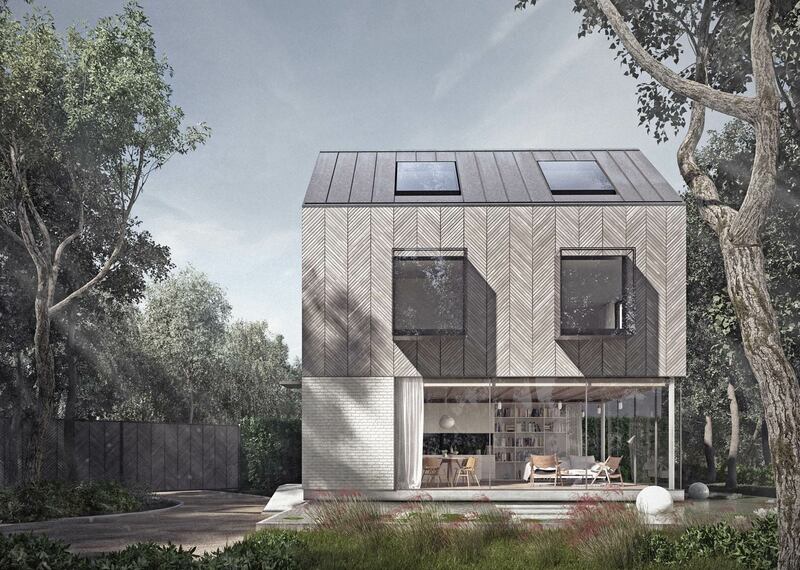 Alternatively, the plans can be altered by your architect and the application re-submitted. Consent is not, however, required to demolish small structures of less than 115 cubic metres. It is also not required when removing any wall, gate or fence which is less than 1 metre high (where abutting a highway), or less than 2 metres high elsewhere in a conservation area. Trees that have a trunk diameter of more than 75mm when measured at 1.5m from ground level are also protected in a conservation area. For works to trees, you must give the local planning authority six weeks’ notice before carrying out work. This gives the authority an opportunity to consider whether an order should be made to protect the trees. In a conservation area, permitted development rights for householders are often removed through the adoption of a special planning regulation called an article 4 direction. The details will be made clear in the SPD published by the local authority for the specific area. Permitted development rights for house extensions are usually removed or restricted in conservation areas. If the relevant permitted development rights have been removed with an article 4 direction, then planning permission will be required for all house extensions. In many respects, a planning application in a conservation area is much the same as any other planning application. A conservation officer from the local authority is, however, more likely to be involved in the planning process, and engagement with the officer is key to a successful application. If you can reference the local conservation area appraisal document and show how the design has responded to the area’s history and character, then the scheme is more likely to be approved. It is also important to present the design in a clear and engaging manner. This could be through a series of evocative design drawings or with models, showing clear intent. A document called a design and access statement is required for all planning applications in a conservation area. The design and access statement presents a good opportunity to explain the process behind the design. There is no national database of conservation areas to check against your property. Your architect will, therefore, need to approach the local authority to see if the property falls within one. This information is sometimes made available on the authority’s website, along with maps of the conservation area and appraisal documents. These outline the key characteristics of the area and how they should be protected. Living in a conservation area should have a positive influence on the design of new buildings. After all, they exist to maintain the character that makes a particular neighbourhood interesting. The conservation area appraisal document should be consulted early, as this will give a detailed description of the local authority’s intentions. It is important to give a clear representation of your design intent, through models (CAD or physical) and illustrations. Any design proposals should be of a high quality, and show a clear interest in preserving or enhancing the conservation area. AFL have won numerous planning permissions in conservation areas throughout the London boroughs. In Camden, we achieved planning consent for a large rear extension to a detached Victorian house. The property is a three-storey, double-fronted house built circa 1880, on a large garden plot. It had existing extensions to the side (garage) and rear (WCs). The property is not a listed building. The Conservation Area Appraisal and Management Statement issued by LB Camden highlights the positive aspects of the area, which is largely residential, the negative aspects and how the character of the area can be enhanced. The document highlights the requirement to retain original architectural details. This was straightforward as the front elevation was left untouched, save for the replacement of the original windows with double glazed sash windows. These perform much better thermally and exclude drafts, thereby reducing the running costs of the house. The profiles of the replacement double glazed sashes had to be similar to the original windows. Slim, 10mm double glazed units were specified to achieve this. A single storey was proposed, except for an existing small rear outrigger that was rebuilt to improve the structural integrity. Keeping the rear extension single storey meant that it was visually subservient to the existing house, a key planning requirement. 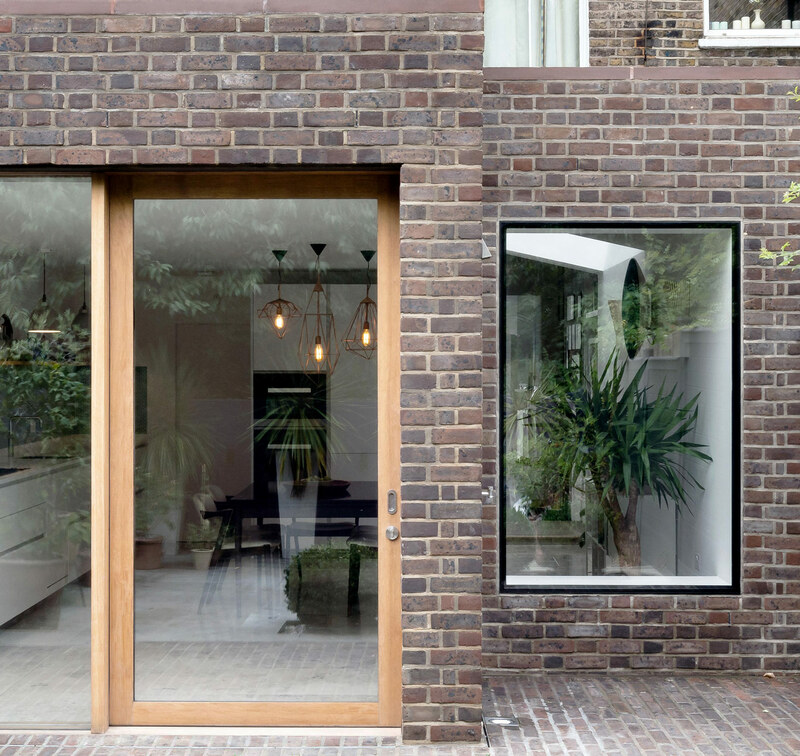 The rear extension cladding materials were traditional (oak, sandstone and Portland stone), but used with modern detailing. These materials enhanced the existing brick and off-white painted timber sash windows. 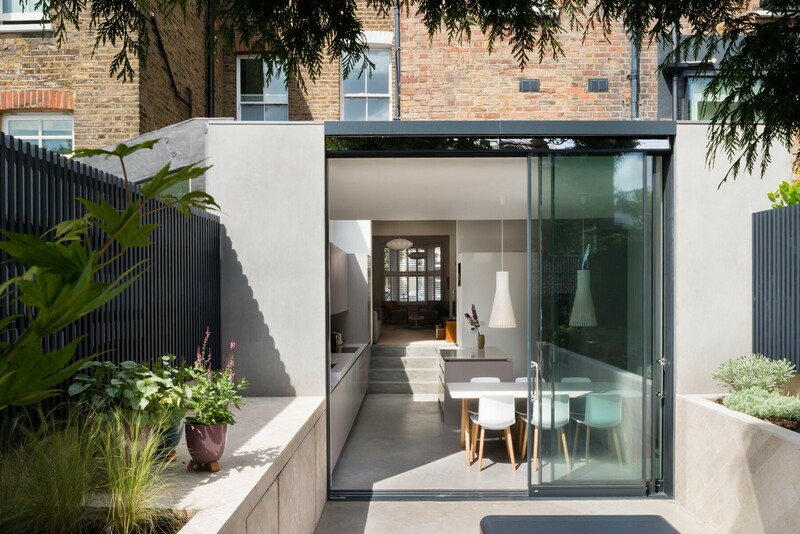 Camden supported the use of an exposed ultra-high-strength concrete frame to form the rear extension, which allowed this to be a lightweight, light-filled structure. Another feature which is now just visible from the front of the property is the replacement balustrade to the roof terrace. Prior to the renovation, the roof terrace was surrounded by a scaffold pole handrail, which was unsafe and unattractive. This was replaced with a clear glass balustrade. The inclusion of a suspended stove in the new rear extension was important to create a visual focus. The stove’s flue did not require planning permission as this was allowed under permitted development rights at the rear of the property, and these had not been removed for this conservation area. One tree in the rear garden was removed and relocated further back to allow for the rear extension. All other trees on the site were retained and protected throughout the work. Please visit our project portfolio to see Architecture for London’s recent projects.